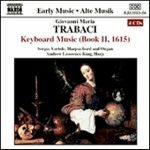 The Italian composer, Giovanni Maria Trabaci, was one of the most important musical innovators in the 17th century. As a skilled organist, his major church appointments in the Naples area provided him with the financial stability to write 165 works for the keyboard. Many serve the multiple purpose of being adaptable for organ, harpsichord or instrumental groups. In technical accomplishment and harmonic experimentation they were to surpass other works composed at that time, and became the earliest examples of the musical period subsequently defined as the Baroque era. Click cover for track listing.